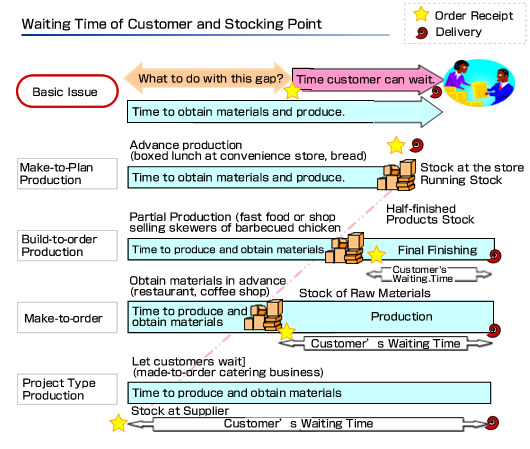 If a customer waits during the entire process after an order was　placed, i.e., designing, purchasing the necessary parts and materials, making the product, and delivering the product, production management could be an easier process to some extent. Builders who build custom homes employ this system. However, normally, customers do not wait for long. Usually, it takes a much longer time to obtain materials and complete the manufacturing process than our customers can wait. As there is no choice, one needs to buy a stock of materials before an order is placed, or to make a product. That is, manufacturers buy time by having the stocks. It is difficult to have proper amount of stocks. Stocks are prepared under anticipation of future events. However, this kind of anticipation can often fall short. Stocks which turn idle can lead to losses. However, companies are taking this risk in order to satisfy customer's needs, and are still seeking ways to reduce the risk as much as possible. In this case, how should we handle the stock? That is determined by how long the customer is prepareｄ to wait. First of all, there is a case when the customer does not wait at all. In this case, the company should hold the stock of the product at the store shelves. An example is boxed lunches at convenience stores. This is called make-to-plan production. Products at the store mostly fall under this manufacturing system. Sometimes the customer may wait for some time. In this case, the product is kept partly-finished, and the final finishing touches are made after the order is placed. Hamburger shops and shops selling skewers of barbecued chicken are taking on this system.There are not many examples of this kind of system of products that end-users directly buy. However, this system may be used between dealers who make a purchase of the products and makers, and between set makers and parts makers. A product which takes time to produce, such as semiconductors, is made halfway, and the final finish is done according to the final order. This type of production is called "build-to-order production". Build-to-order is a combination of make-to-plan production of semi-finished goods and make-to-order production of final goods for a customer starting from the semi-finished goods. When a customer can wait for some time, and when the production process does not take much time, stocks of parts and materials are kept, rather than stocks of partly-finished products.It is less risky to hold stocks in the upper stream of production whenever possible, as it is easier for diversions and resale, in case the stock become idle. A normal restaurant falls under this type. Cases when ordering an easy-to-order suit, buying a PC through the internet, and purchasing a car, fall under this type. There are not many opportunities for end-users to receive this type of production service, but it is often used in buying and selling between companies. This type of production is called "make-to-order". For above three type of production, product design is finished in advance, and which are available as a menu of the product. The bottom part of the figure　shows the system such as that used by builders which I mentioned at first, who do not hold the stock themselves. Stocks are kept with the supplier, for example, a dealer in lumber. After the placement of an order, the product is designed and necessary parts and material are purchased and manufacturing process is starts. This is called "fully made-to-order". It is also called "project type". Shipbuilding, etc., fall under this category. The place to hold stocks during the production process is called the stock point. It is desirable that the stock point be close to the upper stream (left side in the figure) whenever possible. In the whole supply chain process, greater effort is made to reduce stock at the store and running stock, and to quickly replenish the necessary amount of what is needed when it is needed (made-to-order). That is, to place the stock point on the stage of materials and parts. The left side of the line connecting stock point is the sphere of jobs based on anticipation. The right side is the sphere of jobs responding to actual demand. "Stock point" is sometimes called "coupling point", as it is where the anticipation and actual demand meet. A factory needs two kinds of slightly different-natured operations for arranging stock based on anticipation, and for production and delivery based on the actual demand. The more the stock point is located leftward, the easier the anticipation becomes. This is because when the stock of the product level is maintained, sales anticipation by product is necessary, but if the stock at the material level is kept, sales anticipation regarding the product group will be adequate. "Mechanism of a Factory with Illustrations"
Published by Nippon Jitsugyo Publishing. by Mitsuo Matsubayashi and Hiroshi Watabe. Please click here for the web site of Waku Consulting. A new way for you to plan and schedule your factory.